Late in 2004 I began hearing rumors that Hornady was bringing out a new line of superior-quality, high-performance personal-defense ammunition. At that time I didn't know what it would be called, nor did I know what it would look like. Then I received a shipment of several black boxes marked with the familiar Hornady name and carrying a simple "TAP FPD" designation. The ammunition looked special as soon as I opened one of the boxes. It was time to learn more about this new line of ammunition. Hornady's new TAP load is designed for policework as well as self-defense. You can rely on this ammo, to be sure. Hornady has been in the ammunition business since the end of World War II. Joyce Hornady and Vernon Speer started out by making bullets from spent .22 rimfire cases and rolls of lead wire. The bullet business was good, and their gross sales for 1949 totaled $10,000. Although things slowed down during the Korean War, it didn't take Hornady long to get back into the bullet business when hostilities ended. Today it's hard to imagine the shooting world without Hornady. The company introduced Frontier Ammunition in 1964. Initially, the line of ammo was loaded in surplus military cases, but when the Vietnam War heated up, Hornady shifted to new cases. The name has grown into one of the most respected ammunition lines in the world today. In 1990 Hornady added a new bullet to the mix. Available in bulk quantities for reloading or loaded ammunition, the new XTP JHP bullet also became standard fare in Hornady's premium-ammunition line. Associated with excellent accuracy and superb downrange performance, the XTP bullet is one of the most respected projectiles in the industry. Hornady's TAP FPD designation refers to "Tactical Application for Police" and "For Personal Defense." The new line is constructed of only the best materials, and it will be loaded under strict guidelines and rigid quality control. In that light Hornady wisely started things out (with the XTP bullet) on top. Offering controlled, predictable expansion and deep penetration, the load proves the choice was a wise one. I've been using XTP hunting bullets since day one, and they can be relied on to put meat on the table. I've also run a few of them into ballistic gelatin over the past few years, and they continue to perform with perfection. This is a closeup of the .40 S&W load. Hornady doesn't use sealant on the primer or bullet. Hornady won't divulge what powder is behind the XTP bullet in its new TAP FPD loads. I pulled several bullets, and if I had to guess, I'd say that it might come from Winchester. It looks very much like Winchester ball powder, to be honest. Hmm, let's see: 7.3 grains of WW Super Field will launch a 155-grain slug at 1,180 fps, generating 33,200 psi, according to the latest Winchester reloading book. That might be a good place to start, anyhow. I had only two TAP FPD loads to work with: a great 147-grain 9mm load and another gem, the 155-grain .40 S&W. It was obvious that whatever the powder is, Hornady pretty much fills the case with the propellant. Nickel cases have long been associated with high-end ammunition. Not only does nickel look snazzy, it also has a lower coefficient of friction than brass, so it tends to feed smoother in most firearms. Nickel tends to stand up to Mother Nature well, too. Hornady upped the ante a bit by coating the cases with a hard, black nickel coating. The ammunition looks very business-like. This recovered 9mm bullet weighed 147.3 grains and expanded to .558 inch. Once I had the bullet and powder charge removed, I took the time to run a case carefully through a RCBS tungsten-carbide resizing/depriming die to get down to the basics. It didn't take long to discover that Hornady didn't see fit to use a sealant on either end of the new line of ammunition. Down the road I may have to compare a sealed load to one that isn't, but I really don't think it matters much. Anyone relying on ammunition for police duty or serious social work is wise to rotate it routinely and keep it in a cool, dry place. If I'm hunting during inclement weather, I try to keep my rig tucked under my jacket in a shoulder holster, too. My ammunition won't get wet there. Hornady currently catalogs a dozen new TAP FPD loads. The line includes a pair of loads each in 9mm, .40 S&W and .45 ACP. I suspect we'll see the .45 GAP and .357 magnum down the road. In 9mm, the two loads are stuffed with either a 124-grain or 147-grain XTP JHP bullet. Hornady says they leave a 4-inch test barrel doing 1,100 and 975 fps, generating 339 and 310 ft-lbs of instrumental energy, respectively. I had a few of the 147-grain loads to mess with. In .40 S&W, Hornady offers the new load with either a 155- or 180-grain XTP JHP. The 155-grain load is the second test subject here, and we'll look at it in depth shortly. Hornady says that a 4-inch barrel will launch the 180-grain XTP JHP at 950 fps, accounting for 361 ft-lbs of energy. Last is a pair of .45 ACP loads hinging on either a 200-grain XTP JHP or 230-grain XTP JHP. Hornady says its 5-inch test barrel launches these loads doing 1,055 and 950 fps, generating 494 and 461 ft-lbs of energy, respectively. The 147-grain TAP load is identified by Hornady as No. 90268, and Hornady says that it'll leave the pressure barrel doing 975 fps. I got a pleasant surprise when I ran 20 of these 9mm JHPs through an old S&W 5906 TSW yesterday. They left the 3.9-inch barrel doing 986 fps, 15 feet from the muzzle. The 5906 isn't a tackdriver to start with, but 25 of these accounted for five groups that ran from just over 3 1/4 inches to just over five inches. I suspect that the Ransom Rest might pull down these groups a bit. Top-quality ammunition any way you look at it: Hornady's TAP FPD ammo isn't just for pistols. It's also available in popular tactical calibers and 12-gauge loadings. of my block, reaching 14 1/17 inches. In addition to controlled expansion to .558 inch, the load left a good permanent cavity in its wake. The recovered bullet weighed 147.3 grains, indicating perfect weight retention. Nice job on this load. The 155-grain XTP JHP penetrated to 12.5 inches in 10 percent gelatin. Hornady identifies the sample TAP FPD load as No. 91328 and says that it will leave a 4-inch test barrel doing 1,180 fps, generating 479 ft-lbs of energy in the process. I ran 25 of these loads through a brand-new 5-inch Kimber Stainless Gold Match II a few days ago, and 20 of them averaged 1,214 fps over my Oehler 35P Skyscreens with an extreme spread of 25 fps and standard deviation of six fps. Anytime you see extreme spreads and standard deviation down this low, you realize that you're working with very good ammunition. Averaging 1,214 fps, a 155-grain bullet generates 507 ft-lbs of energy. In fact, the Hornady TAP FPD load was the strongest load in the test, running even a tad higher than the hot Cor-Bon 140-grain DPX HP. Downrange, the Hornady TAP FPD load also looked very good. Five 5-shot groups averaged 2.75 inches center to center, with the best group running less than an inch and a half. The largest string went 3.71 inches. This is excellent accuracy any way you cut it. In addition, it's nice to note that the Kimber didn't miss a beat with this or any of the other tested loads. In ballistic gelatin, the 155-grain TAP FPD load performed well, too. The XTP JHP generated an impressive permanent cavity in the gelatin, penetrating to 12.5 inches. The bullet did a good job of staying together, hanging on to 139 grains during the trip. This works out to 89.6 percent. The recovered bullet measured .657 inch across the widest portion, exhibiting an expansion rate of 164 percent. The mushroom is symmetrical, smooth and classic. As you'd expect, since this is considered premium ammunition and is aimed at very specific markets, these loads aren't cheap; if you're looking for plinking ammo, look elsewhere. The two 9mm loads carry an MSRP of $16.82, the .40 S&W comes in at $16.48, and the .45 ACP is the bargain here at $15.71. There are 25 rounds in the 9mm boxes while the bigger calibers get 20 per box. I'd rather see a bigger box with 25 rounds across the board, but that's personal opinion. The 9mm TAP load almost made it out of the gelatin, going 14.06 inches. 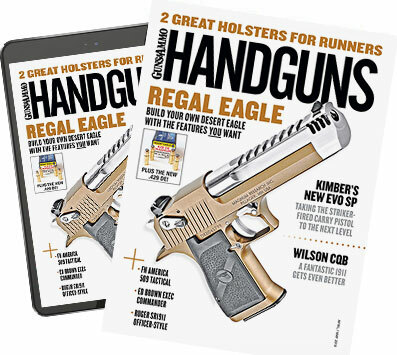 I've said it before in these pages: The major manufacturers are loading such good ammunition these days that there's not much reason to reload, unless you're into shooting thousands of rounds a month. It's a pleasure working with good ammunition, and it looks to me as though Hornady's new TAP FPD loads are some of the best in the industry. I wouldn't hesitate carrying this ammunition in a duty arm if I were in that line of work. I want to add a pat on the back to the folks at Hornady, too, for making this fine line available over the counter. Civilians need top-drawer ammunition, too, after all.